A click clack sofa bed will be one of your best solutions if you have a small space at home and you receive many guests. These sofa beds are versatile and very practical thanks to its two uses: by day it is a sofa and at night it becomes a bed. In addition, its aesthetics and comfort have been evolving to adapt to the needs of each person. Here we review some models, and we tell you about their main features and advantages. Do you need a sofa with storage space? How Does A Click Clack Sofa Bed Work? The click clack sofa beds are named as such because of their distinguish sound they make when they are converted from sofa to bed. A click clack mechanism transforms a furniture into a variety of shapes and positions, depending on the type and model – some transform into a bed and chaise or offer an adjustable back position. A click clack sofa bed works by pushing down the backrest of the sofa until it becomes level with the seat, thereby converting the sofa into a bed. 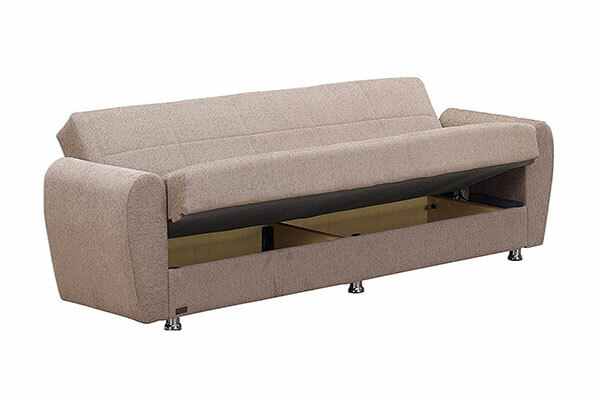 The mechanism inside the sofa may vary between manufacturers, but the operation of a click clack sofa is the same for all models. This type of sofa bed is designed to offer the fastest and most convenient way to supply additional sleeping space on small apartments. These sofa beds have a single cushion overlaying a metal or wood frame with a sturdy back and legs. Some models are designed with cushions and removable parts that need to be taken out when the furniture is changed into a bed, or with additional storage space. The materials used in the backrest and seat of a click clack sofa bed are the same, so the comfort level is the same in the bed or sofa position. 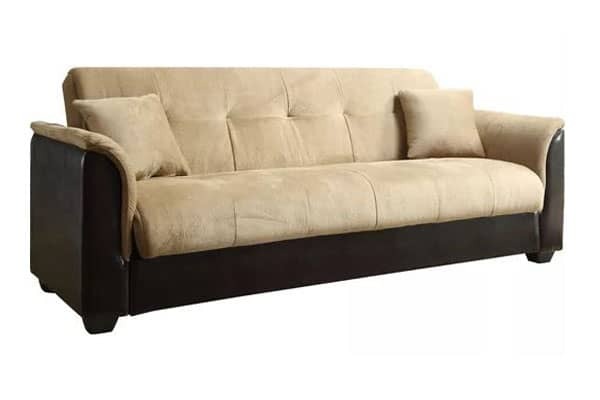 Most sofa beds of this kind are filled with high-density foam that is comfortable and supportive. Other types of click clack pieces of furniture include pullouts, futons, foldouts, corner sofa beds, and click clack chairs. As an alternative for small spaces, you can try a wall bed. If you have overnight guests frequently or a small space to live, you may realize that you need some extra chatting and sleeping space. Click clack sofa beds (aka clic-clac or klik-klak sofa beds) are designed to provide a comfortable spot for sitting and sleeping. These types of sofa beds give a similar feel to sleeping in a traditional style bed and they can fold away when you’re not using them. One of the most asked questions is – are click clack sofa beds comfortable? Just how comfortable is the mattress on a click clack sofa model? To be explicit, click clack sofa beds have a 9-inch or thicker mattress on them that feels like a soft cloud. Most standard bed mattresses are from 10-14 inches thick; click clack sofa beds, at their minimum, are just a small of that range. However, the innerspring coils of these convertible sofa beds are made from steel and are wrapped with a foam fill. Overall, as far as the comfort, they are a bit on the firmer side. 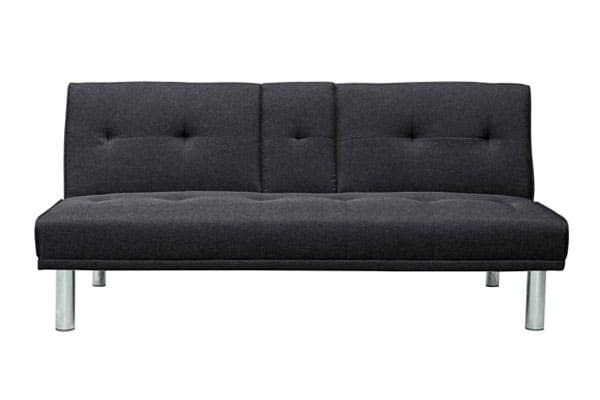 Who Should Buy a Click Clack Sofa Bed? We know that comfort is the biggest factor in choosing a bed. With a sofa bed you may save space, but you won’t get much sleep if you choose an alternative bed option that isn’t comfortable. In general, convertible sofa beds aren’t the most comfortable places to sleep on the long run. Clic clac sofa beds are PERFECT for: people who move around a lot or have regular guests, college students and younger couples, those who are limited by living space and appreciates the transformation of a sofa into a bed and vice versa. Clic clac sofa beds are NOT so great for: retired couples, people who wants or needs a full-size bed, someone searching for a luxury product, someone who needs a good mattress to sleep on. With so many different options out there, it’s essential to think about what you actually want from your sofa bed. To save time and cut back on frustration, narrow down your search from the get-go by considering these basic questions: How will your sofa bed be used most of the time? How often will it be used? What’s your living situation like? Remember: always double measure your space and your sofa before buying it and bringing it home! Because you can not slip your new sofa bed through the doors, hallways, and stairs, no one’s gonna be sleeping well. What About Click Clack Sofa Beds With Storage? These are not average convertible sofa beds. 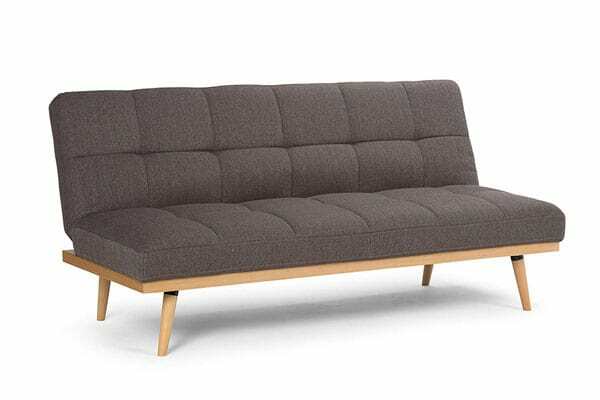 A klik-klak sofa bed take only the best of sofa and futon and combine them into one multi-functional furniture piece. To top it off, you also get the much needed extra storage space we always rave about. 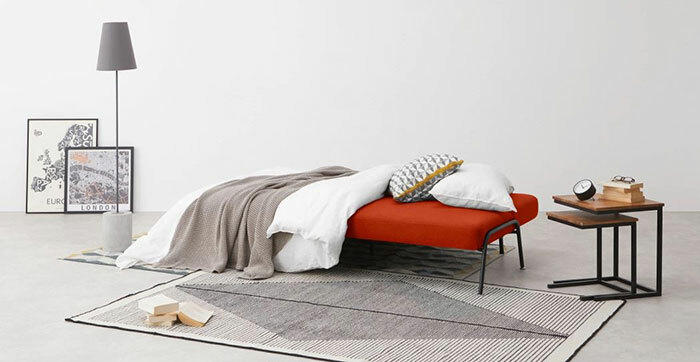 If you get a click clack sofa bed with storage, well… you hit the jackpot. This type of click clack sofa beds has a far more durable mattress than regular sofa beds models or futons. They’re as comfortable as a regular bed, and the storage factor is a definite welcome bonus. Whether designed purely for utility, for comfort, or chosen for aesthetics and style, the furniture that appears in a house says a lot about the people living inside and how they spent their time. Click clack sofas come in many shapes, styles, fabrics, and costs. Speaking of size, depending on your available space, consider a Queen sleeper sofa bed or a twin size sleeper sofa. Select the best one you can afford. Next to a bed, it will be your most important upholstered piece. Contemporary style and practicality make the Spencer Click Clack Sofa Bed a fantastic way to update your home. 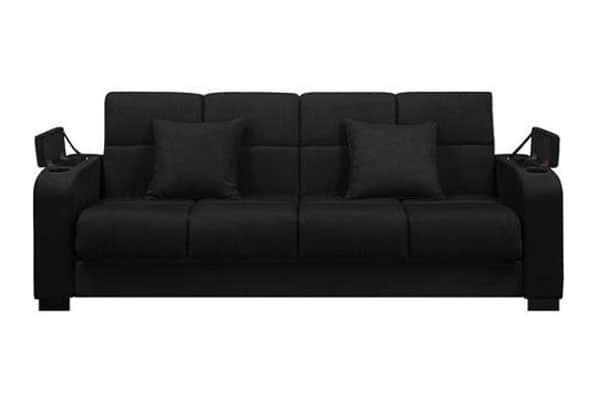 Turn your living room or den into a guest room when you convert this comfortable sofa into a twin size bed. Because the hideaway bed isn’t tucked into the base of the sofa, this sofa bed is ideal for apartments, condos or rooms with limited space. The click-clack mechanism assures easy conversion from sofa to bed. The sofa not only is comfortable but also is light, strong, the fabric feels substantial, not cheap, cushions are firm and looks great on any space! Fully upholstered in a superb Grey woven fabric with sharp stitching, this Middle Console Cup Holders Click Clack Sofa Bed is perfect for any living needs. With a solid wood-frame construction and stainless-steel legs, this convertible sofa bed is supportive and will last for years to come. Its click-clack design allows the seat to fold back that is great for lounging and sleeping. Even added drop down console with cup holders for extra convenience. It’s functional, is a good size, sturdy and modern. This Faux Leather Tufted Convertible Click Clack Sofa Bed from Mainstays has brown faux leather upholstery for a modern look and quickly converts from a sofa to a lounger and then into a sleeper. It can be used in a variety of ways in many rooms of your home. 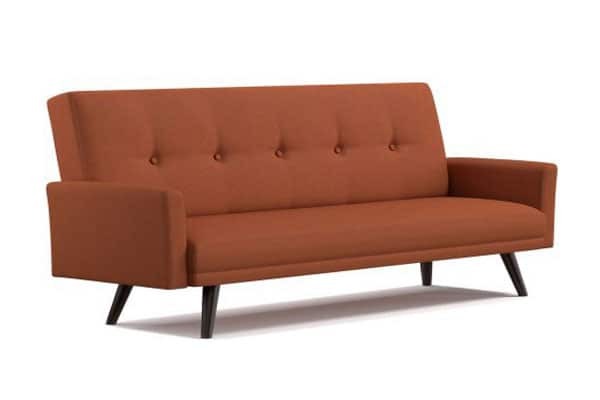 The professional appearance of this brown tufted futon also makes for a comfy addition to an office setting. Great back support, firm and sturdy. About the size of a twin bed, works well for about any size individual. Give your home a modern update by creating a stylish lounge area with this Cooper Convertible Click Clack Sofa Bed from Sauder. This sleek sofa features easy click-clak adjustments that allow for multi-position comfort and function to give you optimal relaxation options whether you are kicking back while watching the evening news or taking a cat nap after a long day at work. Its leather-like DuraPlush upholstery not only gives it a chic look but it also resists wear and stains for any of your accidental spills and dribbles during movie nights. It also features a durable wood frame that is built to last. Include stainless steel legs to add an extra touch of luxurious style. If surprise guests are a regular feature of your home, Brick Champion Convertible Click Clack Sofa Bed is a great option for adding convertible seating that can become a bed at a moment’s notice. This piece features a solid wood frame, foam filling with slight tufting for a clean, contemporary look. When a guest is spending the night, the back folds down, and this piece transforms into a full-sized bed. 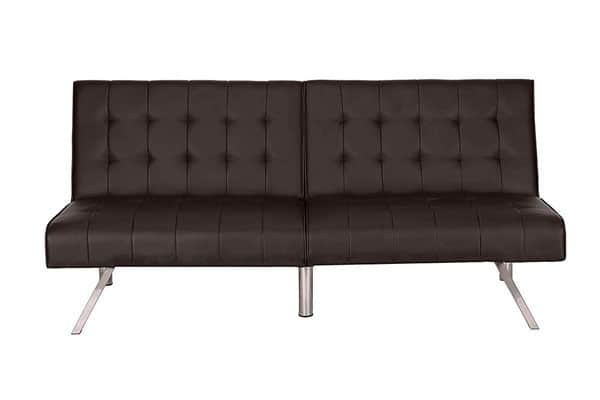 The comfort rating on this sofa is medium firm and accommodate 2 persons comfortably. Zoe Convertible Click Clack Sofa Bed is fully upholstered in a superb grey linen fabric with sharp stitching. This is a timeless piece of furniture, perfect for any living needs. With a solid wood-frame construction and stainless steel legs, click clack sofa bed is supportive and will last for years to come. Its design allows the seat to fold back that is great for lounging and sleeping. 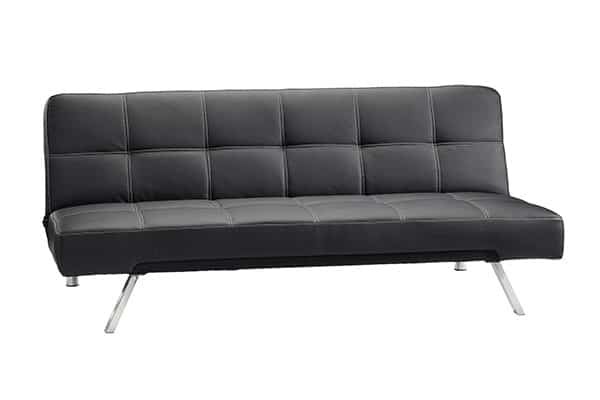 With its elegant design and sublime comfort, the DHP Zoe convertible sofa bed is a perfect addition to your home. Melbourne Click Clack Sofa Bed features a five button back, flared arms and a sleek bench style seat. Converts easily into a full-size bed. Tapered solid wood legs in a dark espresso finish for strength and style. Durable, easy clean, 100 percent polyester fabric. Allows you to sit, recline and sleeps two comfortably. Foam pad and polyester fiber filling on the seat and back cushion for comfort. Mixed hardwood, plywood and metal frame construction for strength and durability. Seats up to 600 lbs evenly distributed. Cleta Convertible Click Clack Sofa Bed offer the perfect extra seating in your game room or office and transform into a comfortable bed for overnight guests. The high-density foam cushion is covered in a Gray faux linen cover that will coordinate with any decor. The firmness level of the seat is medium. The Colorado Convertible Click Clack Sofa Bed is the perfect addition for any home, apartment, dorm room or studio. With a modern and subtle design, it is constructed from the highest quality materials. The hidden storage units underneath the seat offer you a place to stow away valuables when you head out for the day. The sofa bed can transform into a sleeper in a matter of seconds with absolutely no hassle. Equipped with two plush pillows and easy to clean upholstery, this convertible sofa bed is the ultimate all-in-one product. The Tyler Storage Arm Click Clack Sofa Bed is designed with a storage area and cup holder built into each arm. It converts into a full-size bed with the touch of a hand and is covered in a durable, stain-resistant, 100 percent polyester microfiber and requires no tools to assemble. The sofa sleeper is a versatile piece of furniture that has a three-position, click-style hinge which allows you to sit, recline or sleep comfortably. It features a 10-inch pillow top seat cushion for extra comfort, steel seat, and back frame with metal-to-metal connections for strength and durability. Before you invest in a convertible sofa bed for your office, house, or apartment, there are some considerations you’ll want to make. A clic clac sofa bed is not quite as comfortable as a traditional bed but it’s good enough for temporary situations and younger people who can sleep on just about anything. Here are a few tips for selecting the right convertible click clack sofa bed for your needs. The most important things worth considering is how easily the clic-clac mechanism converts the bed into a sofa. The back folds down with a simple click-clack mechanism allowing you to transform a sofa into a comfy double bed or recliner for yourself. Since these best sofa beds come in different sizes, such they also come with different types of mechanisms. Also, each furniture builder uses its own system, often the differences are very small because the movement is the same. What may differ is the quality and nature of the materials used for these mechanisms. As we discuss mechanics here, the click-clack mechanisms must be greased/oiled every six months. Mechanisms are made of metal, so while using there may be some distinguish noises. Choosing a sofa bed with a quality frame is the second most important aspect, as this will impact the overall life of the couch. Choose a frame made with durable materials, so the click clack bed is likelier to stay stable over time. 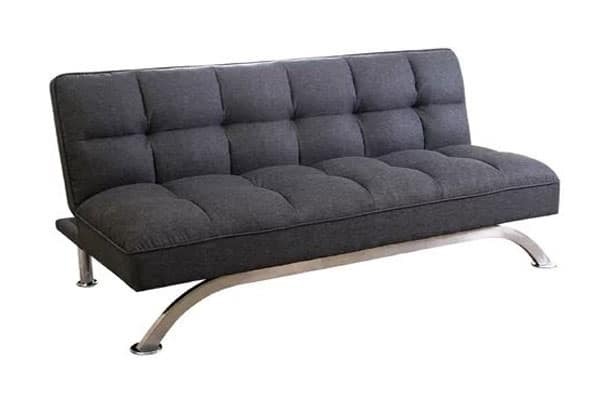 As for the frame material, most use aluminum to keep the sofa bed light yet strong. But it’s not uncommon to find a sofa bed with a wooden frame. The majority click clack sofa beds convert to about 47-50 inches wide. Two people can fit, but its a little bit of a tight squeeze – some sofa beds can sit three, four or more people. Think about the size of your family and the guests you’ll be accommodating before choosing the best size sofa bed for you. If you are planning to use the sofa bed as a couple or you need a lot of sleeping space to roll around in, get the biggest sofa bed you can get. Before buying, check the dimensions when the sofa is flattened into a bed. It’s hard to come across a queen or king size clic clac sofa bed. You shouldn’t expect a clic clac sofa bed to be as cozy as a normal bed, but it should be comfortable enough so you won’t wake up with back pains. If you can, check the upholstery material and kind of filling the sofa bed uses. Most sofa beds use polyurethane or a type of faux leather. As we previously stated, you’ll need a warm blanket or comforter since the upholstery material can get a bit too cold. For a softer sleeping experience, look for sofa beds that use velvet or microfiber upholstery. As for the filling, most sofa beds use foam. The foam is usually on the firmer side. So if you are used to sleeping on a plush memory foam mattress, it will take some time to get used to the new sofa bed. Or, you could invest in a mattress topper to make it comfy. The budget clack sofa beds are generally temporary solutions. This means that if you intend on using this sofa bed frequently, expect to buy another one within 2-3 years. Keep in mind that these sofa beds have faster wear and tear than the more expensive ones because of the quality of materials. Medium clack sofa beds contain innerspring coils within the seating and backrest. These sofa beds tend to be more on the firmer side for sitting, yet are more than substantial for occasional sleeping. Lastly, we have the higher end click clack sofa beds that should hold up for about 10 plus years. These sofa beds contain individually wrapped pocketed coils in the seat deck and backrest and measure in thickness from 7 to 10 inches. These click clacks are built like a firm conventional mattress and can hold up from every day sitting or even sleeping. As there are a big number of manufacturers on the market, you will notice major differences in terms of prices. As a good rule, always try to buy the best quality that is pocket-friendly, but keeping in mind quality is directly proportional to the price you pay. 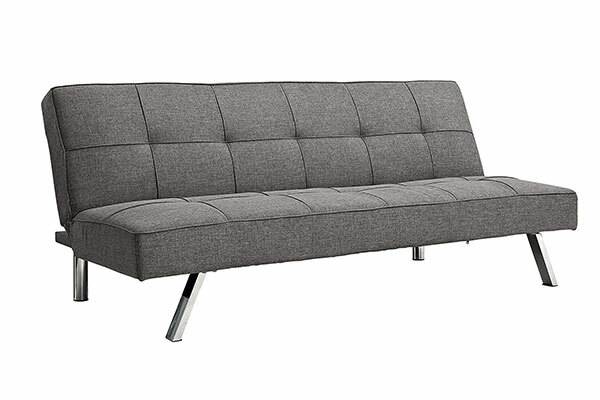 How much do you want to spend on your new klik-klak sofa bed? If you’ll be using your couch bed a lot, you may want to invest in a more expensive and quality friendly model, whereas a budget model should work just fine for a sofa bed you’ll only use it temporarily for overnight guests. Most clic clac sofa beds have two positions: upright and completely flat. If you want more flexibility, get one with three sitting positions: upright, reclining and completely flat. Also, consider how you’ll use it – it’s mainly for sitting or sleeping purposes? And what’s the ideal height for your couch for the best level of comfort? An overlooked factor, the materials of your sofa bed will impact how you’ll care it over time and how much it will last. Cleaning your sofa depends on how often you use it and how you use it. It also depends on the kind of sofa and the kind of material it is upholstered with. In any case, your sofa should be cleaned regularly to keep it in pristine condition. There are many sorts of upholstery available. There are fabrics in a wide variety of qualities but common to all is that the elasticity of the fabric is determined by the fibers in the thread and the way the fabric is woven. It is this elasticity that determines whether a fabric can be used for a particular model, but also the amount of wrinkling after use. Finally, check if the sofa bed you buy offer some extras. The three most common accessories are cushions that can also be used as pillows, cup holders in the arms, or cupholder that you access by pulling down the middle section just like in a car’s rear seat. Anything else will be a great addon. A click clack sofa bed offers an extra bed for guests and convenient seating your family, but it usually lacks in the comfort area. Find out next how to create a comfortable sofa bed your household and guests will love to sleep on. Add a Mattress Topper: It is not always needed, but something to consider. The extra padding will protect much better your back and make your sleep more comfortable. The material you choose for a mattress topper is a matter of preference as long as it is thick and adds extra comfort to the base of the sofa bed. They are not expensive, they don’t take a lot of storage space, and are very easy to use. Buy a Mattress: A more expensive way to improve the comfort of a click clack couch is to buy a new mattress. Most mattresses range in width from 4 to 5 inches. Currently, the five most common mattresses are made of memory foam, natural latex, urethane foam, air over coil, and coil. The most accurate way to determine the size you need to order is to measure your sofa bed frame. Measure the width and length of the inside of your frame and round down to the nearest inch. Fill in the Gaps: An easy and cheap way to improve the comfort level is to fill any gaps with small pillows. Might not be the most technical approach, yet, in most cases, it works. Using these pillows along the split edge of a click-clack sofa bed can give you a better night’s sleep. Chose the Right Size: The comfort level on a sofa bed is directly related to the quality and size. 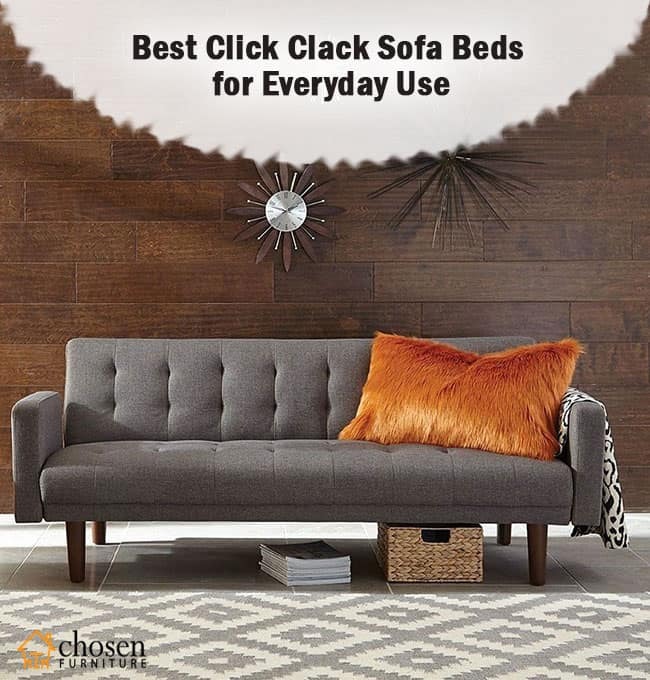 Shop for a click clack couch that specifically matches your size and consider buying mattress clips to keep the sheets in place, especially if you do not plan to use a topper mattress. Use a Duvet: You should consider to sleep on a duvet instead of using it to cover yourself. Most duvets are thick enough to offer extra support and comfort where you need it. A duvet is a type of bedding that is a soft flat bag filled with down, feathers, wool, or a synthetic alternative. It is protected with a removable cover. Adding a duvet to your bed makes the whole chore of making your bed a lot easier. Add Supports Under the Frame: Sometimes the best way to make a convertible click-clack couch more comfortable is not to add something on top, but to support it from underneath. Sofa beds of all kind often could use a little extra support, so consider adding additional legs or wooden bed slats to provide firmness and prevent any sagging in the middle of the bed or around the edges. Not having the right support can lead to a slew of issues, whether it’s lack of sleep or back problems. Add a Featherbed: A featherbed is like a down comforter that you sleep on top of rather than pulling it over you at night. Adds softness to hard beds and rejuvenates old mattresses. Simply lies on top of your current sofa and is held in place with corner straps under your fitted sheet. Now you can enjoy a great night’s sleep and wake up well rested and energized. Store Extra Bedding: When closing the klik-klak sofa bed, it is best to remove the bedding instead of folding it up with the sofa. Store the bedding in a wardrobe, armoire or another cabinet when you fold the bed away. Even better, buy a click clack sofa bed with storage! The decision to buy a brand new click clack sofa bed is the same as another piece of furniture, you have to pick on a model that is both elegant and comfortable. 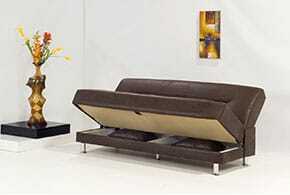 It is essential for you to learn how the opening and closing mechanism of this type of sofa bed works. Click clack sofa beds are perfect for college students or a younger couple just starting out. However, if you’re looking for an expensive piece of furniture, maybe these are not the best choice. They are cost-effective, super lightweight, and incredibly versatile. Depending on your lifestyle, a click clack type of sofa bed could definitely be the right sleep station for you. In the end, if you read the above reviews, you will be able to end up with a quality click clack sofa bed that worth your money. Picking any furniture largely depends on personal tastes, therefore, take time to surf the internet on sofa beds before making an ultimate decision.